Learn all about the new Questyle QP1-R personal DAP - Digital Audio Player - at Totally Wired. We review the QP1-R and discuss why it's better than both and iPod and other players. Also how to make the most of the sound quality of the QP1-R with both headphones and connected to real world hifi systems. This is a better mousetrap story. While not the first portable music player, the iPod changed everything - Apple took ownership of the concept and made it hugely popular. And then they did it again with the iPhone. But somewhere along the way the simple idea of just playing your music got subsumed in the vast ecosystem that is now iTunes and iOS. And the sound of any iPod or iPhone (or anyone else's smartphone) really isn't any different from the original iPod. Everything else has become vastly better in this time - DAC design, high resolution music formats, the ability of anyone to make great music without the need of a full studio. Let's not forget the proliferation of fantastic sounding headphones either. But it doesn’t matter if you have a $89 iPod Nano or a $1400 iPhone 6sPlus, the sound is pretty much the same. Various parties have tried to make a go at better quality players - probably the most high profile being Neil Young’s Pono. Astell & Kern have been on our radar but the combination of eye watering prices and yet another Australian based distributor have put paid to that one. And of late there have been a good number of mass market companies looking to leverage their way into what they see as a potential market - but as always they are big on hype and features and simply not that hot on sound. What we need is a specialist company with the resources, smarts and experience to design and produce a player that sounds great, does away with feature overload, is built to last and with just a bit of luck, is affordable. Ladies and gentlemen - I give you Questyle. Chances are this is the first time you have heard of them but there are obvious similarities to NuPrime - both companies have a unique approach to amplifier design, are dedicated to better sound at reasonable prices and have an especially strong line up of headphone and digital products. And it's from this base that Questyle have launched the QP1-R.
For any original iPod owner, this is like meeting an old friend - the QP1-R is reassuringly solid, controlled by a central scroll wheel and just works. But this old friend has got much, much better. Right now the QP1-R is the hot ticket amongst high resolution personal players - we'll get to the sound and reviews very shortly. Having only got a quick hands-on a few weeks ago, I'd been converted in the first minute. Every aspect of the Questyle is class - the packaging, the build quality is like nothing I've come across before in hifi and the operation is genuinely intuitive. These aspects alone would easily justify the price. But hey, it's got to be about the sound quality and this is where there QP1-R leaves everything else out there standing. For a fraction of the price of any comparable audio separates the Questyle delivers stunning resolution and fidelity - forget any talk of limitations inherent in digital audio. I’ve been listening to albums I know like the back of my hand and without exception I'm hearing great swathes of music I’ve never heard before in any context. There are plenty of reviews that go into more depth on the sound quality and the matching with a pile of very nice headphones of all styles. I'm thinking the QP1-R is a whole lot more than just a swept up iPod - it really is a serious source component in its own right that can be connected into almost any system with remarkable results. As well as a dedicated headphone socket, the QP1-R features a combined line out and optical digital socket. Given the quality of the internal DAC and driving circuitry I'd suggest the line out capability of this player exceeds pretty much any CD player and most DACs - remember we've got full hi-resolution happening here so we're already well above the CD standard. The Questyle player also neatly overcomes any storage issues that limit the iPhone or iPod touch - there is both internal storage and two micro SD card slots giving a total capacity of 288Gb. That's a huge amount of quality music. Part of the drive behind players such as the Questyle is the ability to store and play high resolution formats, 96k, 192k, and DSD. Most of what I actually enjoy listening tends to less esoteric yet I'm finding that all mp3s and, even more so, mp4s sound just great. One cool little thing I’m seeing is that a number of Bandcamp downloads are coming in as 24bit (CD is 16bit). I've got these on my little MacBook and up until now, the replay via iTunes has been limited - with the QP1-R I've just dragged and dropped these in and suddenly they are sounding much better - as an example get in and buy the new Average Rap Band album - El Sol (this is Tom Scott's new band - previously he's recorded as @Peace and HomeBrew. If you're a Mac person download it as AppleLossless, otherwise Flac. Getting music onto the Questyle player is simple - pretty much just connect it, drag and drop from the music you have stored on your laptop, computer or drive - given the increasing complexity and defaults associated with Apple Music and iTunes this is going to make a lot of sense for many people - the QP1-R is all about the music. As already noted, this is a simple player - there is no wifi, bluetooth or networking. To make anything other than a direct connection would compromise the underlying sound quality - plenty of other players out there are willing to build in a whole lot of features but there is always a trade off between quality, features and price and we aren't going to go there. As a player to use when working or travelling around, the QP1-R is as good as it gets. The long battery life, bullet proof construction, ease of use and great capacity mean you’ll be able to enjoy all your music anywhere, anytime. The Questyle is designed to be able to get the best from almost any headphones - you can easily alter the gain to match sensitivity and their experience in designing high end headphone amplifiers comes to the fore with a remarkably open yet powerful sound with no nasties. Most of my listening so far has been with the Sonus faber Prymas, the NuForce in ear models and the Stax Electrostatics - in each case the sound I’m getting is the best I've heard from any of these models and suspect our legions of Grado users out there will be equally impressed. Despite it's size I'd suggest the QP1-R is at least the equal of the NuPrime HPA-9 as a headphone amplifier which is no small amount of praise. The amplification involved translates directly into exceptional sound when you connect the QP1-R to any form of system - the volume can be either fixed or variable so it can run active speakers directly, a power amp. Or run into a preamp of integrated where you'll choose to use that to control the volume - in all these setting it represents remarkable value - it's effectively a high end server. In our own system at home I've found it gives a better rendition than almost any separate DAC connected to my laptop either via usb or even more so wirelessly. The sound is deep, rich and powerful - with resolution to burn. The last thing it sounds like is a little portable player. It's also worth remembering that all the storage within the QP1-R is solid state - unlike earlier iPods with a hard drive - outside of the controls there are no moving parts in the player which means we'll be looking at excellent long term reliability. You can also have the player plugged in and charging while playing. Anyway - here a a few snippets from the web. There is a real buzz out there so if you go searching I’m sure you’ll find more. But why just read about it - come in and have listen if you can of just bow to the inevitable and get one - you’ll be glad you did! 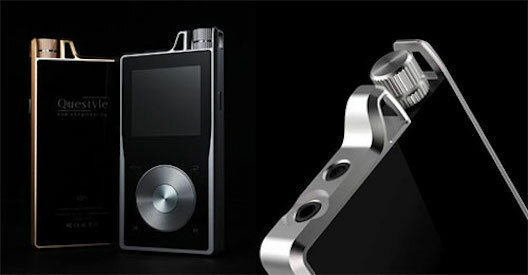 Questyle QP1-R Digital Audio Player NZ$1650 including GST. 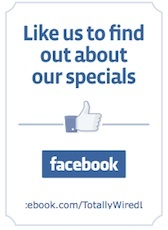 Free delivery, gold and silver finishes. "So, when your iPod Classic finally dies and ascends to the big Apple in the sky, I would enthusiastically recommend moving up to the Questyle QP1R instead of purchasing another iPod. With its impeccable sound quality, flexible storage, and ability to drive a wide variety of headphones the Questyle QP1R ranks among the best portable players I’ve heard. 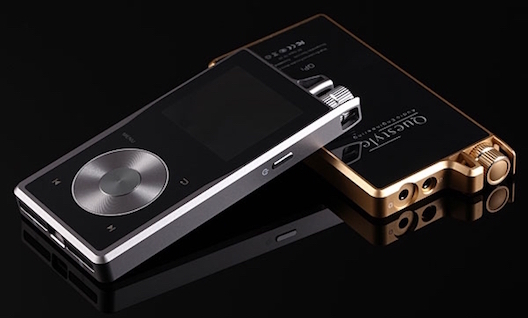 The Questyle QP1R’s shortcomings are that it is only a portable player. It is not a portable USB DAC or USB-to-SPDIF converter. If you require more functionality, there are many other options, but if your primary requirement is for excellent sound in a robust and well-designed portable player, the Questyle QP1R should be at the top of your audition list." The Absolute Sound.